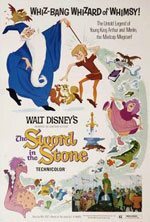 It's been 45 years since the 1963 release of Disney's "The Sword in the Stone". To celebrate this milestone anniversary, Disney has released this timeless classic on DVD. Prepare to be enchanted for 79 minutes as a young apprentice named Wart teams up with Merlin in an attempt to pull the magical sword from the stone and become king. Merlin takes Wart under his wing after the two meet in the dark woods. Wart becomes the squire of Sir Kay the knight. After forgetting Kay's sword Wart pulls the sword from the stone as a replacement. After proving himself to the kingdom, Wart becomes the King of England, King Arthur. The word "timeless" describes this movie best in that it is just as fun as it was 45 years ago. This is truly a film that both parents and children can enjoy. The film looks very impressive on DVD despite its age. The new transfer is beautifully restored and cleaned up the damage done to the film with time (that was evident in the first release of the DVD). Even with a 1080p upscale it still looks like classic Disney. The DVD includes an impressive amount of bonus features. Disney was generous enough to throw in two entertaining Mickey and Goofy short cartoons. Children will appreciate "the old stuff" watching Mickey battle a giant and Goofy being a knight for a day. Children will play as Wart and learn from Merlin in "Merlin's Magical Academy Game". Along with several trivia questions, you will navigate your way to safety as a fish, squirrel, and bird. Another fun feature included on this disc is a one on one with Walt Disney himself as he shows the creative process that goes into a film such as this. The DVD also features the Sherman brothers, discussing what it took to create this magical music. So whether you're looking to get this for your child, or looking to get back in touch with the child in you, the fun of this movie will work magic. Download The Sword In The Stone from the iTunes Store in Digial HD. For more information about The Sword In The Stone visit the FlickDirect Movie Database.